Lovely dark beige colour girls First Holy Communion card with gold letters that said "On Your First Holy Communion". 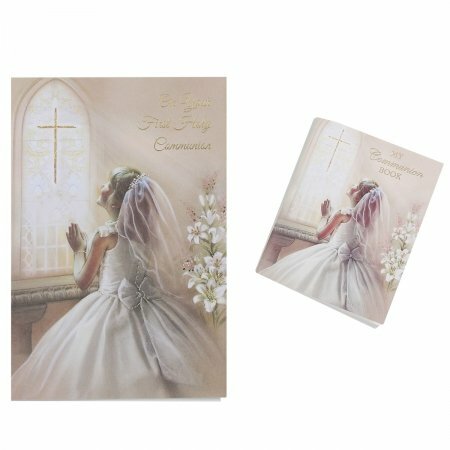 Inside the card reads "Wishing you every happiness as you celebrate your First Communion Day"
Size of the card is 11.5cm (width) by 16.5cm (height). A 64 pages Communion Book with the Order of Mass and Prayers is included with this card. The book is colour illustrated with favourite Prayers. Supplied with an envelope in a protective transparent wrapper.